What can I even say about the Minions? I’ll start at the beginning. In the first Despicable Me film, the minions were purely comedic relief in an overall solidly balanced, and a little emotional film about…well…adoption and love – no matter where that love comes from. Despicable Me 2 also had a great deal of love involved, but you could tell the focus of the minions was higher than the previous film – that’s because they know kids love the characters, so they were boosted in the sequel and then given their own movie. How did I feel about that? To be honest, I sighed rather heavily when I learned this was an actual thing – because it took a great childrens animated series and turned it into a circus side show…that being said, how was it? Pretty much as you’d expect. Minions is a prequel to the Despicable Me films taking place, mostly, in the ’60s. The Minions sole purpose in life is to serve an absolutely despicable master, or, super-villain. The only problem is that every single time they start to find a “big boss”, something goes very wrong. That is, until they see the villainous ‘Scarlet Overkill’ on the television – looking for henchmen. So off to London they go – to serve the biggest, baddest, evilest villain around! Alright, so the only reason this movie is understandable is because it has an obligatory narrator explaining the stuff you don’t understand, like the Minion’s speech problems. That’s not completely horrible because other movies do the same thing, but you do understand why they need him. Other than that, this film has the same problem as Penguins of Madagascar. Both films focus primarily on the comedic relief characters, but the one problem with that is – in both instances, both characters heavily rely on something else to balance the movie out. In Penguins, they replaced the main characters in Madagascar with a new set of animals. 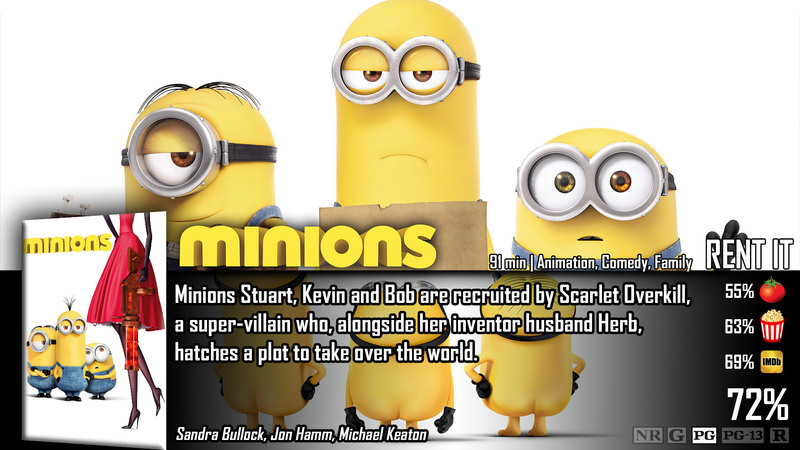 In Minions, they replaced Gru and his scientist with Scarlet and her husband Herb. Please tell me what the point is in that? To me, that isn’t originality, that’s a cheap replacement that’s plainly weaker than the original. I will say that between these two similar-concept films, I do like the characters of the Minions better – so in general, I liked this film while watching it. 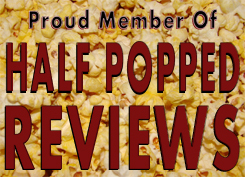 It’s not really a great movie or anything, but it has some pretty substantial laughable material – mostly through physical humor. There’s nothing deep about it, no hidden messages or moral to the story…it’s just plain and simple – these are little stupid goofballs doing little stupid things…enjoy. When they do their thing, though, there’s a lot of great nods to the time period this film takes place in – which was really, really smart for the adults watching as well. At its core, this movie is completely pointless and kids will probably forget it by this time next year – but at the surface…kids will love it in theater and adults will have fun watching it with the rest of the family. In that sense…it’s really not that bad…it’s certainly watchable. I wouldn’t necessarily say waste money to see it in theater, but it wouldn’t be a bad rent later on down the road. Minions isn’t as bad as I thought it would be – it provided a lot of comical scenarios that the entire family can giggle at in the theater. It’s not really substantial, it’s mostly just a cheap mock-up of the realer and more important series, Despicable Me. When I went to the theater to see this film, it wasn’t packed with a bunch of bouncy and giddy kids, but instead a plethora of drugged-out teenagers that giggled at the stupidest stuff.